Blind Selection Wood Shutters are hand-crafted and expertly finished. A labor-intensive, hand-finishing process involving multiple sanding adds to their beauty and enhances their stain or paint color chosen. Choose from beautiful, tinted whites to match your trims. 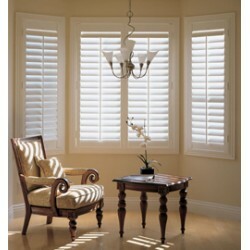 These shutters, manufactured from the highest-quality hardwoods, are one of the most beautiful and d..